The troubled Japanese company Olympus will release M. Zuiko Digital ED 12-50mm f/3.5-6.3 EZ lens for the Olympus PEN camera. The new lens will be based on micro four thirds system (MFT). Size will be 24-100 mm on a 35 mm camera. The new camera lens is resistant to dust and water and offers an electronic motorized zoom that allows users to zoom automatically, though the manual option is still provided. Also present is a linear motor that presents a qualified auto focus when a user is recording video. The lens also has a macro mode shooting feature complete with a button to turn off the auto focus when necessary. 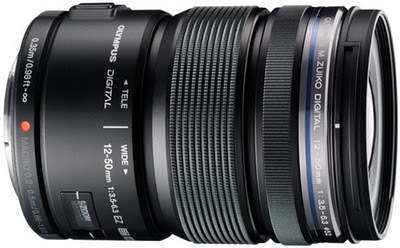 The new M. Zuiko Digital ED 12-50mm f/3.5-6.3 EZ lens will cost 640 USD and will be available at the end of January 2012.